Our guide to mastering the mighty Winston with tips, counters advice and more. In the next of our Overwatch Hero guides, we'll show you how to play Winston like a pro using Ability advice and loads of strategy tips. Overwatch's Winston is a super-charged, super-intelligent and technologically advanced ape who makes use of high innate mobility and protective shields to provide an extremely flexible tanking service for his team. Thanks to a leaping ability which allows him to get into the thick of the action nice and quickly, Winston excels at initiating fights and helping his teammates make a rapid push towards whatever the objective at hand happens to be. His weapon - an electricity-spewing Tesla Cannon - doesn't do a huge amount of damage to any given target by itself, but the good news is that all of its damage is auto-aimed if you're pointing it roughly in the right direction. This makes it a little easier for you to focus on the bigger picture in any given battle, and keep your attention on targeting the correct priority opponent as you bounce around the battlefield. It's exhausting but very rewarding stuff! Editor's note - Update #3: As we head into 2018 and Overwatch's eighth competitive season we've tidied up this guide considerably. You'll now find every piece of advice and sliver of information is bang up to date. We'll continue to update this guide over time, so stay tuned for more in the near future. A new event has just hit Overwatch! Check out our essential Retribution guide for all the tips, tricks and strategy advice you need to master this new PVE mode. Winston is one of the easier tanks to play in Overwatch, but playing him to a high standard will of course take some time. Here's a look at how each of his powerful Abilities work, and how you can use them to wreak even greater chaos on the battlefield. Tesla Cannon [LMB] - Terrible at aiming? Winston and his Tesla Cannon should make a pretty good partnership for your playstyle. Even better, this weapon actually pierces through any protective shields or barriers that are standing between you and your target. Note also that if two or more targets are close enough, the lightning bolt will actually spread amongst them. Keep moving aggressively and playing fearlessly as Winston - you must remain in the thick of battle to make any meaningful kind of difference. Barrier Projector [E] - Winston's Barrier Projector is particularly powerful when it comes to both taking and holding objectives. Anyone standing within its protective field will be able to fire back at the enemy team, while themselves enjoying immunity from the return-fire - as long as the barrier sticks around, of course. 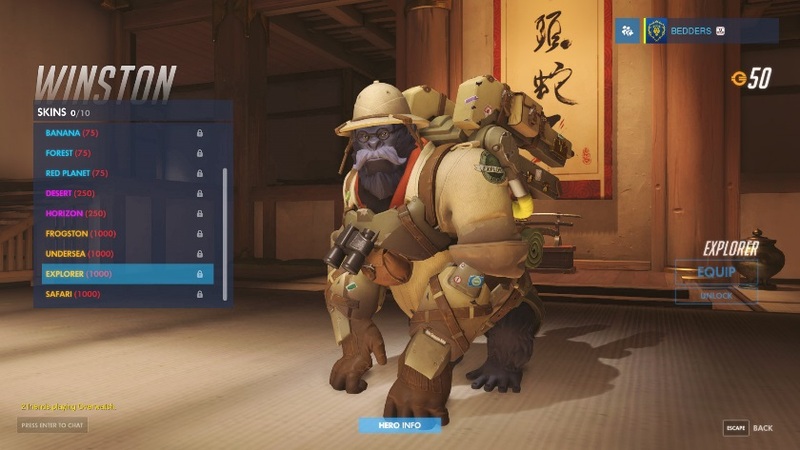 Once activated, the Barrier will spawn directly around Winston, so try to get amongst the middle of your friendly pack before dropping it. 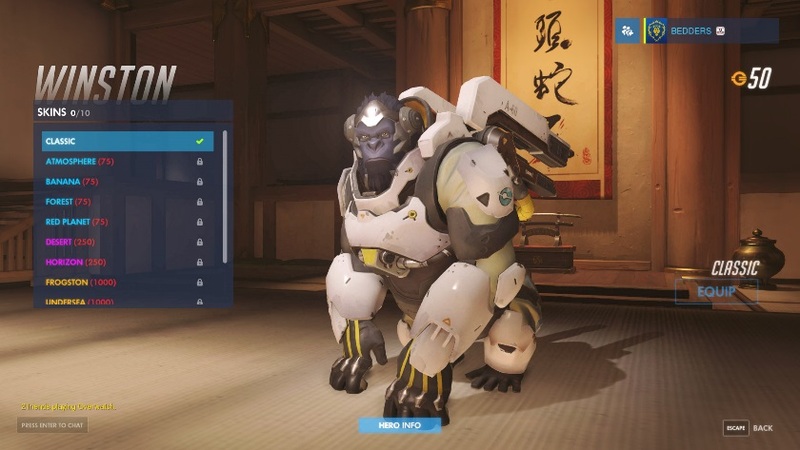 Jump Pack [LSHIFT] - Not only does Jump Pack allow Winston to get stuck into the enemy team faster, it also delivers a small but not insignificant amount of damage to anyone standing near to his landing spot. 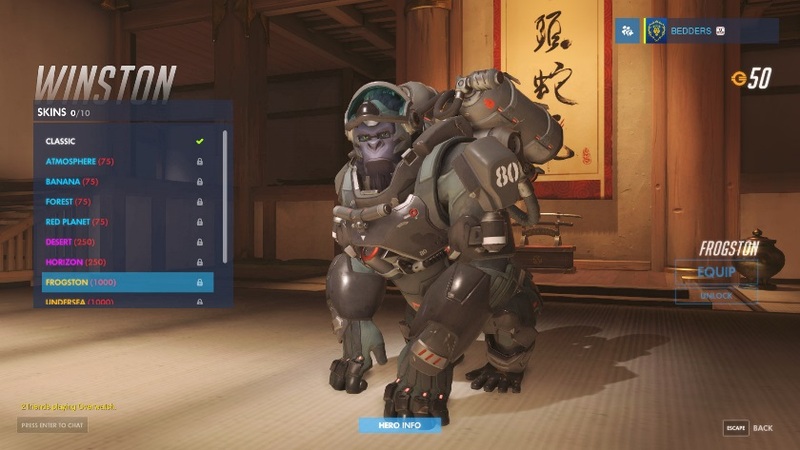 Be aware that, rather than simply bounding forwards, Winston will move in whatever direction you happen to be facing when you activate Jump Pack. It can take a bit of time to master the precise, cannonball-like trajectory you need to aim for in order to land cleanly on your target - mess around in Practise Mode until you've got this crucial mobility skill licked. Primal Rage [Q] - Winston's a pretty tough cookie in general, but once his Ultimate Ability is activated he becomes a near-unstoppable force to be reckoned with. 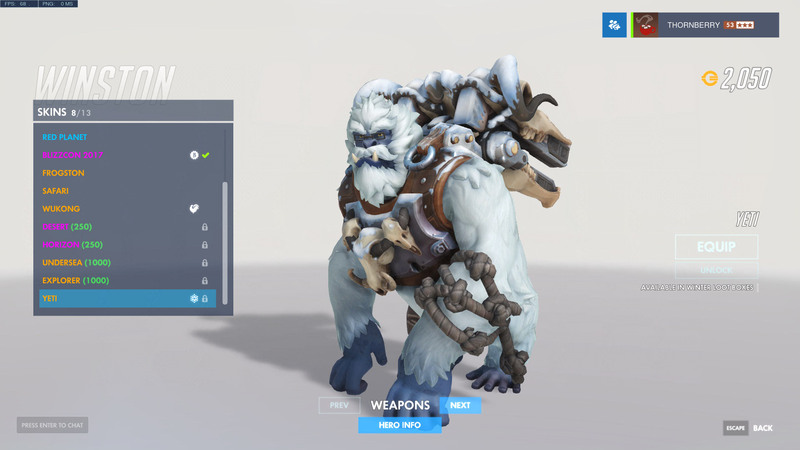 Activate it to completely restore Winston's health, shorten the cooldown on Jump Pack to a mere 2 seconds (down from 6), and turn your LMB-bound fists into knockback melee weapons of destruction. The damage isn't exactly unwelcome by itself, but its the bonus effect of pushing enemies away from objectives that really gives Winston's Ultimate its bite. Winston's a great starting point for new Overwatch players who fancy taking on a tanking role, but there are a few strategic tips for this character that will really help you shine straight away. 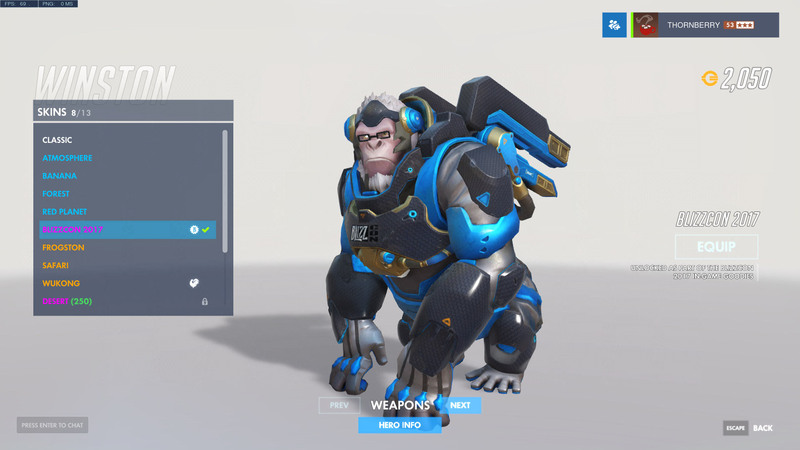 Let us know your own tricks of the trade in the comments section, and we'll add them to our Winston guide the next time we update it. Reliable though it is with its auto-aim function, you may just find it faster to clobber a near-death enemy with V than use your Tesla Cannon. It takes a little while for the sparks to charge up, which might just give an enemy healer the time they need to rob you of your kill. Barrier Projector and Jump Pack work incredibly well together. The latter gets you into the thick of battle quickly, while the former provides you with some sort of protection the moment you land. More importantly, it also gives your teammates some protection to run into while the fight plays out. We find doing a little hop before using your Jump Pack gives you a boost to height and distance covered. What's more, it's also somewhat easier to control the direction you're heading if you're already in the air when initiating the booster pack. Be particularly careful when selecting what target you're going to fry. If it's Reaper, Roadhog or even D.Va you'll need to exercise extreme caution as they've each got the fire power to down you quickly. We recommend tickling them with the Tesla to draw their fire before bounding away. Find ways to distract instead of committing to a kill - be an annoying menace. You can make life much easier for your team if there's a Tracer or a Genji roaming around. Find them as Winston, then start strobing them with your auto-aiming Tesla Cannon. It'll drive them absolutely mad. On Payload maps, consider jumping right up onto the Payload itself and popping your Barrier Projector. This will provide a fantastic shield for your teammates, as they hug the objective and scan back and forth for approaching enemies. It's not for no good reason that Winston's been given such extraordinary mobility. You're surprisingly squishy for a tank, so keep moving with Jump Pack and withdraw as soon as your health gets perilously low. It can be much more effective to prod, poke and frustrate the enemy team with this character, than play a static tank. Don't forget you can knock people off the environment too! Nothing will make the opposing team scatter like a well-timed Primal Rage. Use this Ultimate ability to create maximum disruption for the other team, and let your friends do the job of finishing off the individual targets. By all means use Jump Pack to get into range of a fleeing enemy, but be careful you don't bite off more than you can chew. Anyone close to death is likely heading back towards their teammates, who may well give you a problem of your own to deal with! You can and should use your Jump Pack ability to deal with the most annoying backline Heroes such as Hanzo or Widowmaker. Get in there, make light work of your target, and then start getting stuck into your next victim. 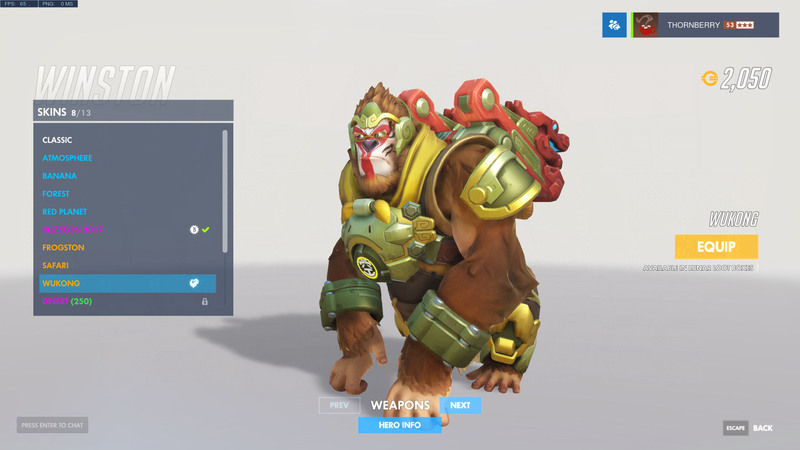 It's always better to save Winston's Ultimate Ability for when he's close to death, rather than using it as soon as it's available. 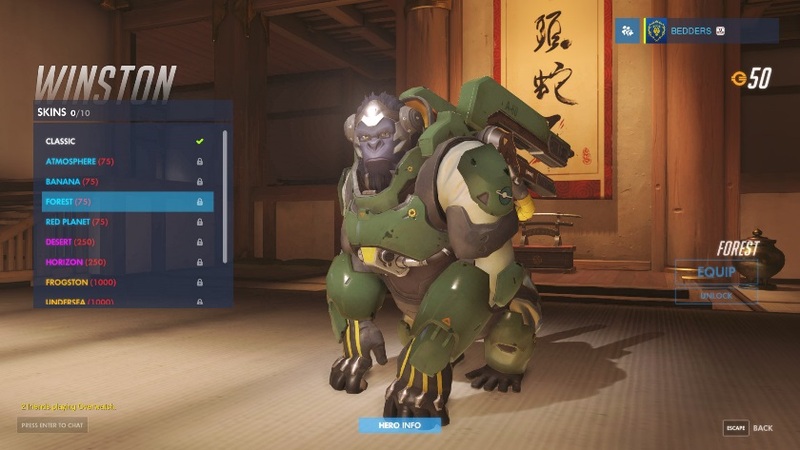 It instantly restores Winston to maximum health, keeping you in your tanking role for much longer. Keep in mind that Barrier Projector does not prevent the damage careted by melee attacks, AOE effects or channeled weapons from striking their target. Every Hero in Overwatch has their own direct counters, and it pays to read up on how Winston stacks up against the rest of the pack in general. Here's a quick runthrough some of his biggest threats - and his priority targets. 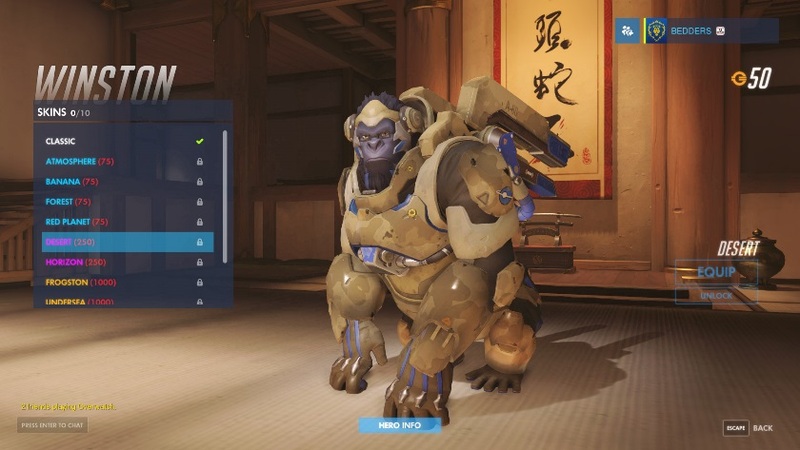 As well as being strong against the Heroes listed above, Winston can also neatly negate a lot of Junkrat's AOE damage. He's also good at picking off enemy Support Heroes due to his innate mobility strengths. For help with handling other Heroes in the game, make sure you check out our huge Overwatch Counters guide. 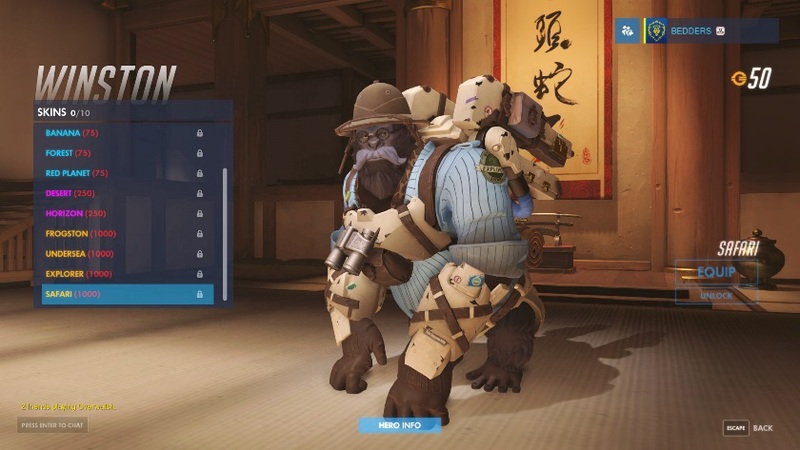 Winston's collection of customisation options feels a little weak compared to the rest of the game's Heroes, but there are still plenty to work towards. Here's a breakdown of everything - minus the Sprays - that you can either buy with Credits or loot with a little luck!